Welcome to #30DaysofDope - March 2017 Cycle! Can I just tell you how excited I am to get this ball rolling? I stopped and started and stopped and started and stopped planning the first 2017 cycle of #30DaysofDope. I wanted to launch in January, but didn't wanna prey on the New Year Resolution type folk. I started to start in February, but I knew I wouldn't be able to give it my all. And I'm very much of the mindset that if I can't do it right, I shouldn't do it at all. That said, I'm so glad to have you joining me on this journey. I can already feel it - this cycle is gonna be something special. Something new. Something more dope than the previous iterations. 1. Make sure you're on the list. When you go to www.30daysofdope.com, there should be a pink bar at the top of the page saying "Join the #DopeFam". Once you add your e-mail and first name to that list, you're in. If for some reason you can't make it do what it do, just drop me an e-mail at christina[at]30daysofdope.com and I'll add ya! 2. Download/pin/save/screenshot the official prep list for this cycle. You can find it on this post here, or download it direct here. We'll be chatting about experiences with Necessary Endings and Chase The Lion intimately on our weekly e-mails and posts here, and I want to make sure you've got everything you need to be on the same page with the group! 4. Document where you started. In the same vein as writing your goals down, the only way to measure your progress is to know where you started. If you're looking for a mental shift - say, going from feeling frustrated about xyz, start by journaling what frustrates you, why you're frustrated by it, and how you wish you would be able to handle/address the situation in an ideal world. Same thing with physical and spiritual. If I want to lose 5 pounds this month, or cook at least 2 meals a week, I need to start by being honest with myself about my current state. This may also involve a "before" picture - although you don't have to. It might be a hard pill to swallow, but I promise you'll be looking at yourself on March 31st like GO ME! If you need a little more guidance, or a few tips on how to make this cycle of #30DaysofDope a success, click here to read my kickoff thoughts from the last cycle. Some of the info has changed, but the principles still apply! Day 1 is almost done. The next 29 is going to be nothing short of amazing! I added both your addresses! You're on the list! Oh, what is that you're drinking? 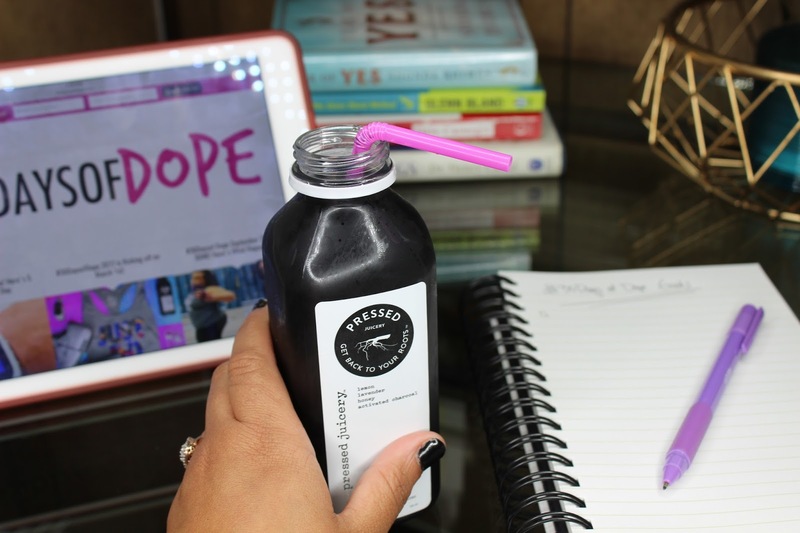 It's a pretty yummy activated charcoal drink. Most juiceries have them in some variation. This one has lemon, lavender, and honey added in.